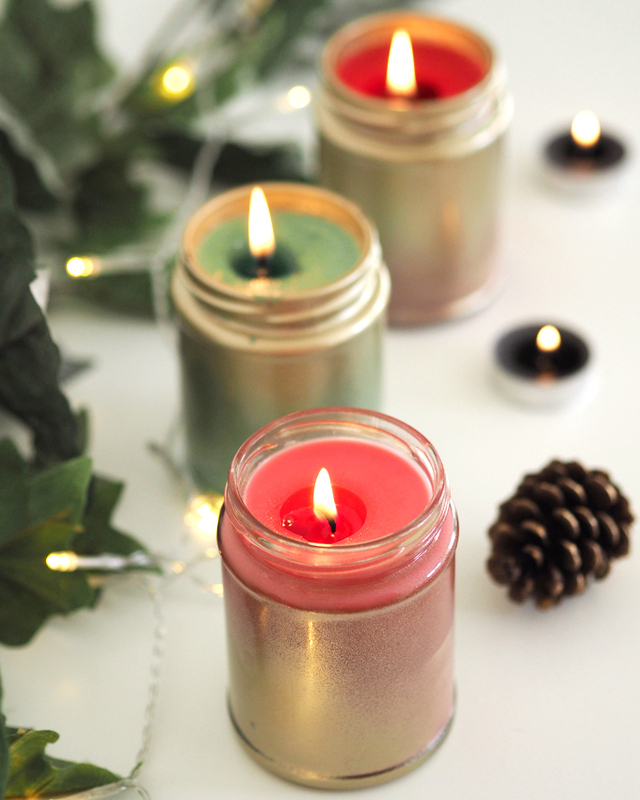 I love this time of year, frosty mornings, cosy blankets and lighting all the scented candles I can find! 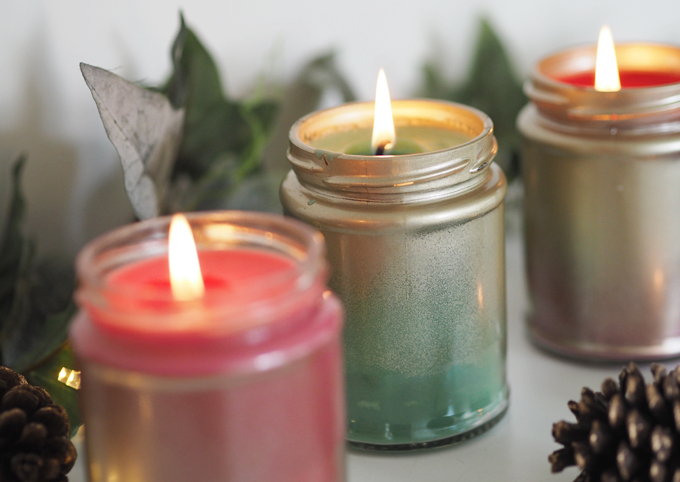 But as pretty as they are, candles can be expensive, so as part of their ‘A Crafty Christmas’ campaign, Provident challenged me to make my own at a fraction of the cost. Fancy making your own? Keep reading to see how I did it and how much I saved! I used some old peanut butter jars for the containers and sprayed a gold ombre effect on each one before letting them dry. 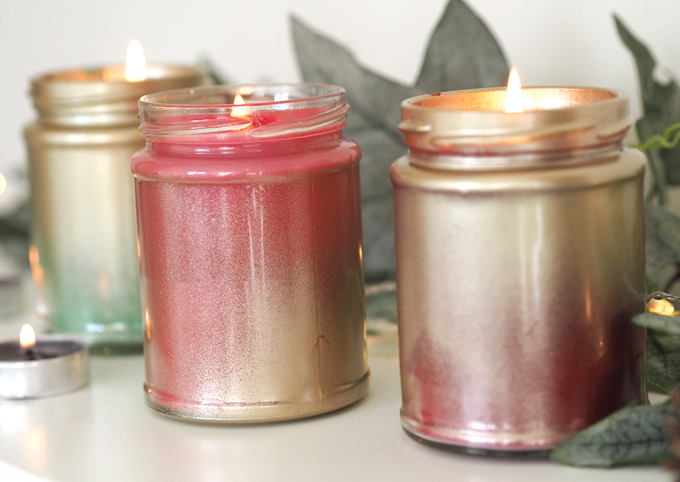 I love pretty candles so spraying old jars is a simple, low cost way to make stylish containers. Once they had dried, I stuck the wicks to the bottom of the jar with a little double sided sticky tape and pushed it down with a pencil. 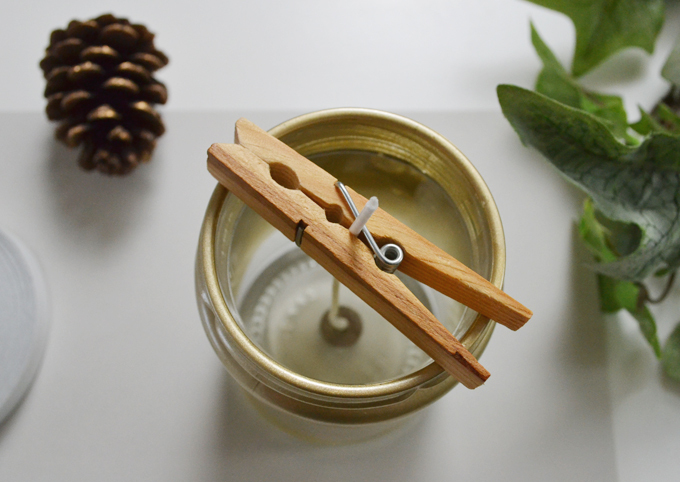 I used a large wooden peg to hold the wick upright and stop it falling to one side when I added the wax. I set all my jars up before I started making my wax so they were ready to go straight away. 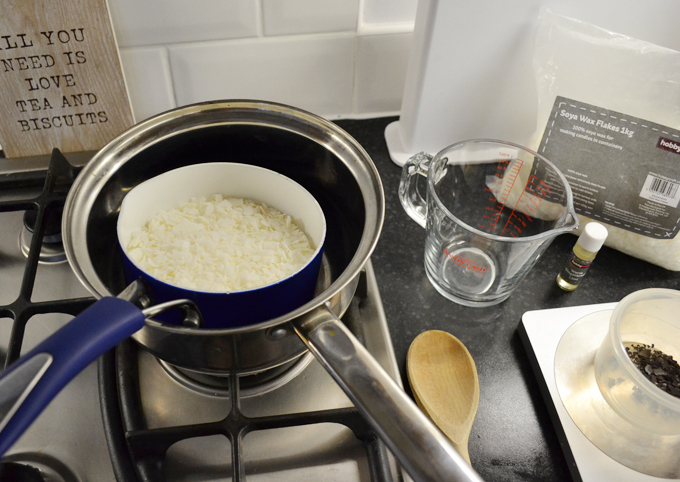 When making my wax I mainly went off the instruction on the packaging and the size of my pan, so I measured out 250g of wax and divided the other ingredients to fit around this. Luckily 250g of wax made exactly the right amount to fit into one jar (about 300ml), so altogether my 1kg bag made four candles! 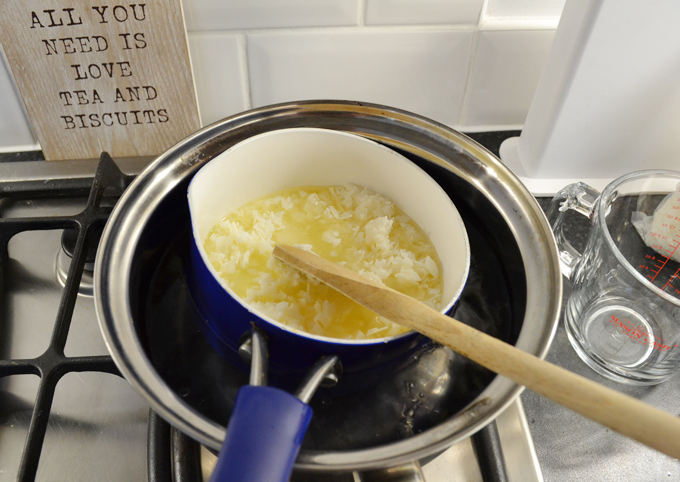 I melted my wax in a sauce pan over boiling water as not to over heat it, and stirred it continuously. 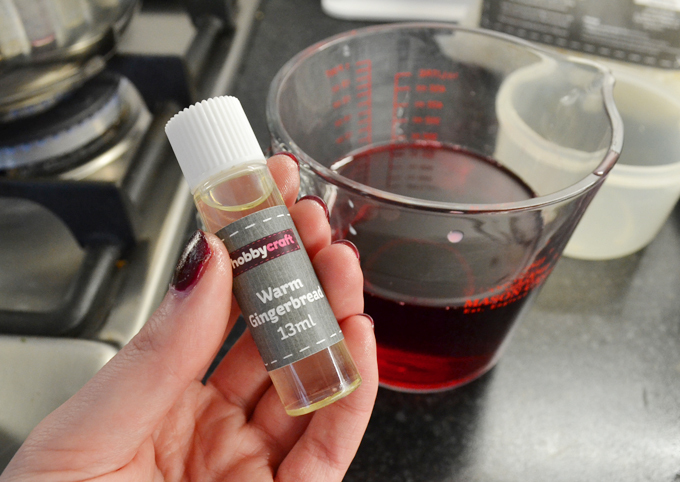 Once all the blobs of wax had melted I kept stirring for another minute before pouring into a jug. 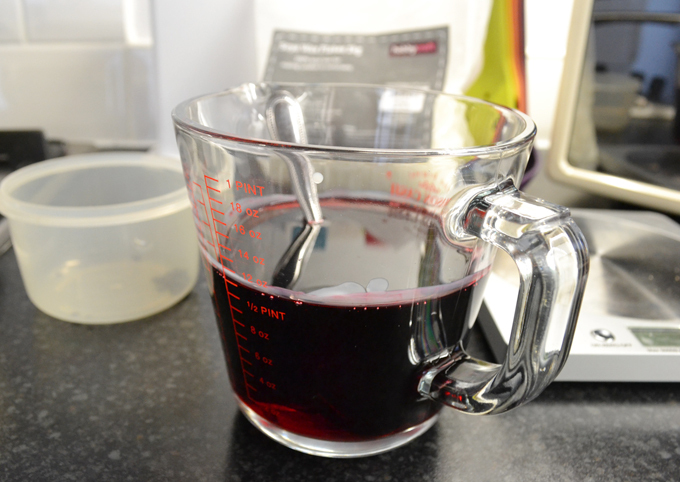 I then added a small amount of dye (around 1g) to the jug and stirred until all the dye was mixed in. 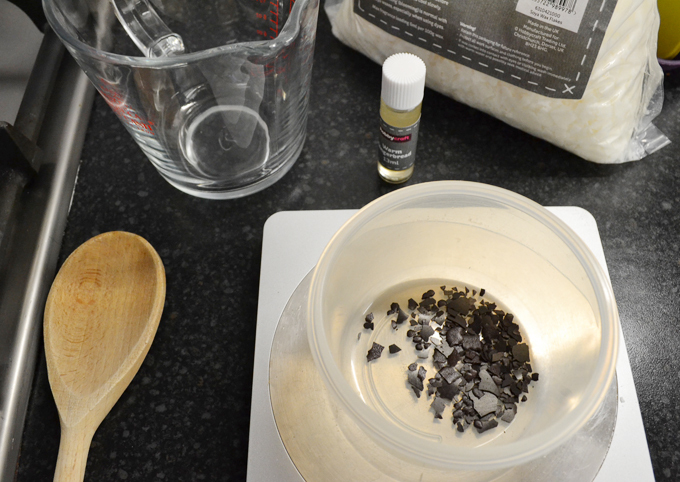 Next I added one whole bottle of the fragrance to the jar and stirred again. I found the fragrance was really strong on the first candle I made, so tried halving the amount on the next candles and found this created a more subtle smell. 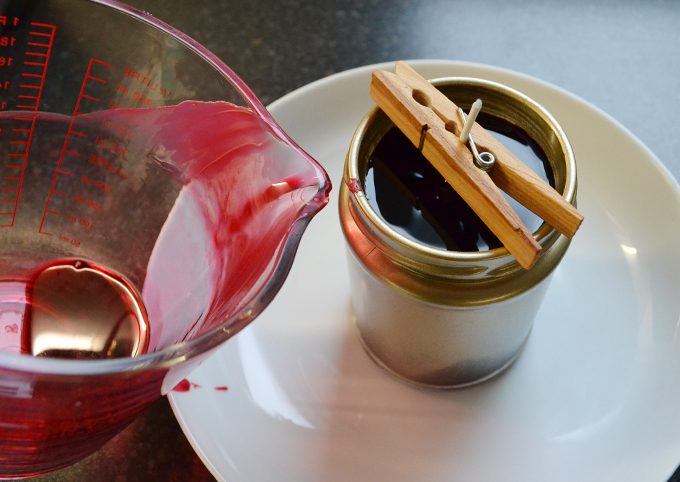 Once everything was mixed in well, I carefully poured the wax into my jar filling to a few cm below the rim. I repeated this processes with the other jars and set them aside to cool and solidify. 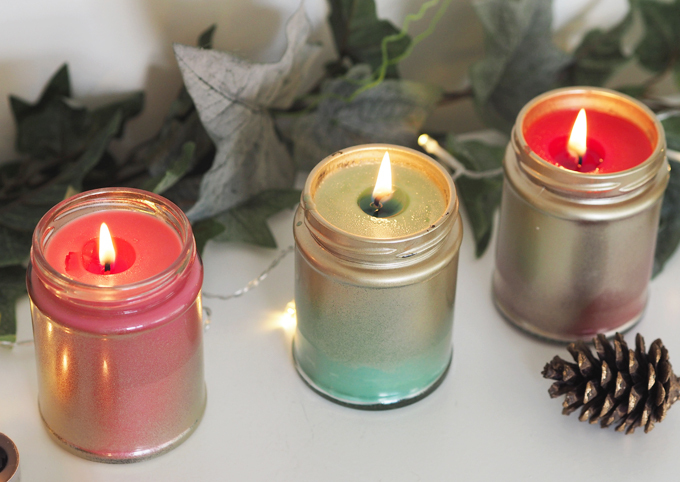 Having never made candles before I was a little overwhelmed at the process but once I had made my first one I loved it and felt a lot more confident making more.I was pleasantly surprised at how easy and enjoyable these candles were to make once I got going. 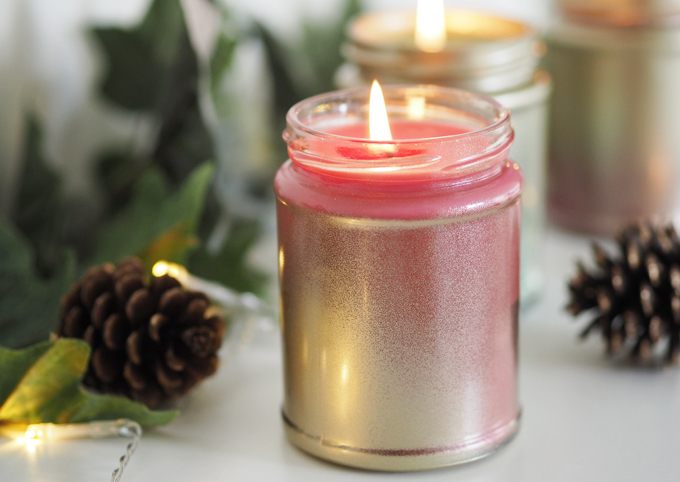 The only downfall is the cleaning up afterwards, it’s definitely worth making a big batch of candles in one go to avoid too much mess. I’m super proud of how they turned out, how pretty do they look?! 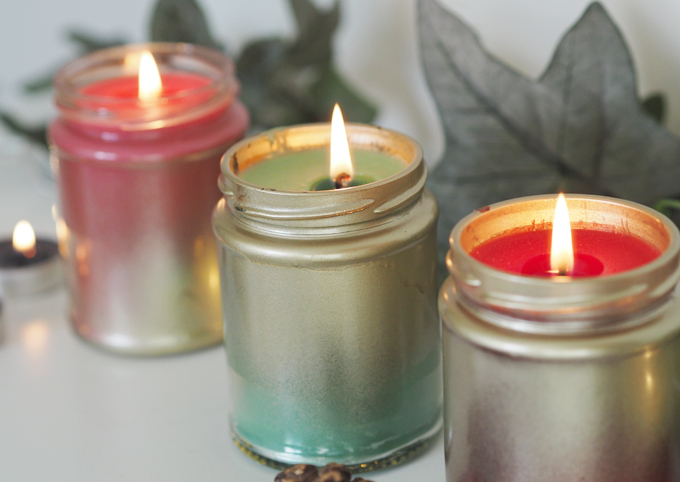 They will make great Christmas presents for candle loving friends and family too! Over all I worked out that each candle cost around £4.90 to make which is a bargain! I think if I were to stock up and bulk make these candles they would be even cheaper too! 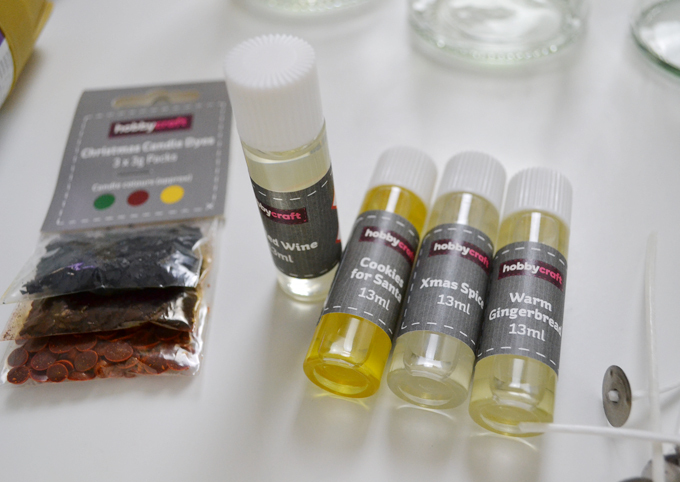 What will you be making this festive season? 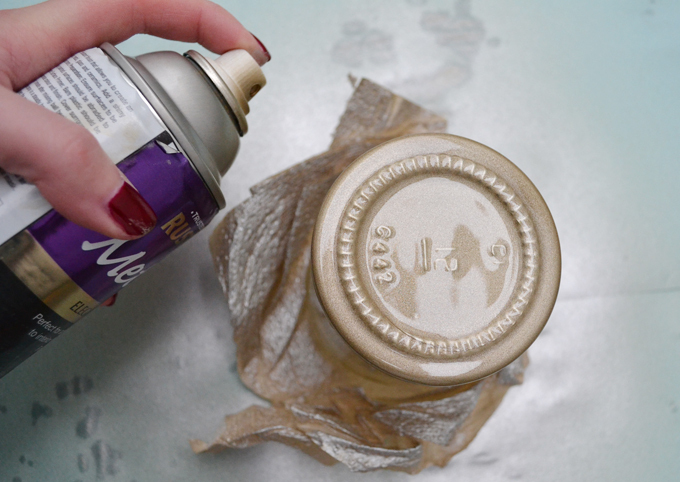 I am thinking of doing #DIYDecember and posting a new craft every day in December (eek! ), if you have any suggestions for things you would like me to make, leave a comment below or tweet me over @madeupstyle on Twitter! I would love to hear your suggestions! 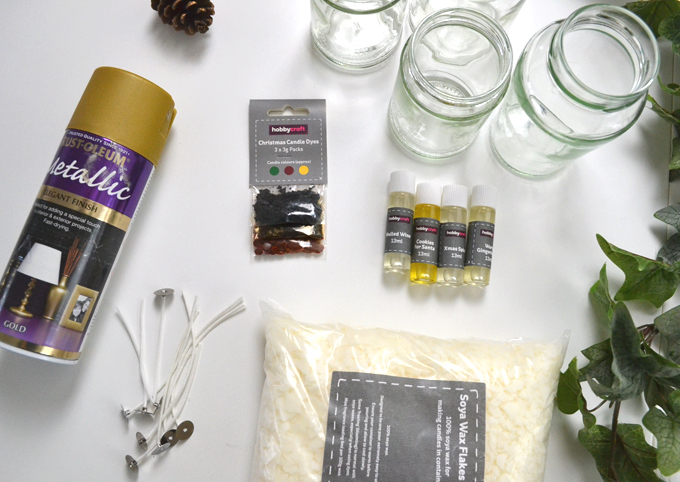 A big thanks to Provident for asking me to part of their ‘A Crafty Christmas Campaign’, check out the other blog posts to be inspired to get crafting this Christmas. All products marked * were kindly provided for me. Ah thank you, so glad you enjoyed it! !